I was at the Business Start-Up Show recently, a trade show with seminars and over 300 exhibitors targeting the small and start-up business market. I stopped by a number of stands that day, and although I was there as a ‘punter’, I couldn’t help but keep putting my B2B Marketing hat back on to critique their performance. I had pre-registered for the Business Planning Workshop that Sage were running as part of the extensive seminar programme. I was booked onto the 10.30am slot, on the first day of the show. I got to Earls Court early, but had to take a phone call that I didn’t want to take in a queue of people, so was only able to join the substantial queue at 09.45, with doors opening at 10.00. 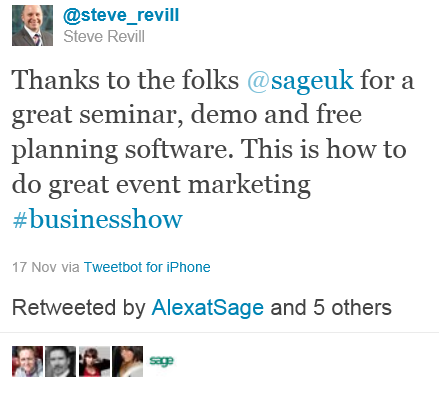 Clearly, the marketing team at Sage were geared up for engaging with customers and prospects, and tweeted back, which started a conversation with the brand before I had even got into the building. Fortunately, soon after, common sense prevailed and the organisers started letting pre-registered delegates through en masse without signing-in. I managed to get through to the Sage stand where I was met with a friendly smile and a member of staff that personally escorted me to the Business Planning Workshop, which was about to commence. 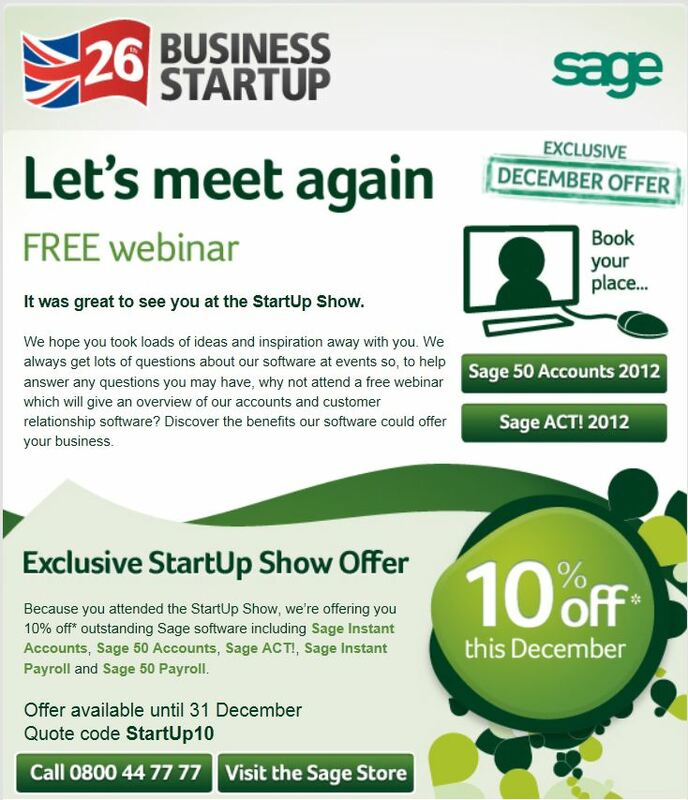 The workshop was very useful, and with free planning software as a giveaway, I definitely wanted to find out more about what Sage offered as I had traditionally associated them with accounting software. Their exhibition space was well laid out, open and inviting. There were well signposted zones for information on various product types, and I found the people friendly, knowledgeable and engaging. I received a demo on Sage Act! from a member of staff who was extremely patient as he ran through the demo and answered my questions. It would have been the easiest thing in the world to push for a sale, after a 40 minute demo, but it felt to me like the strategy for the day was engagement and lead generation. I happily gave my contact details and agreed to receive a follow-up. After visiting maybe a dozen or so other stands (and walking past all others), most appeared to lack any kind of clear strategy. A day or two later, I got a follow-up email from someone introducing themselves as my account manager, with their contact details should I have any other questions. A couple of weeks on, I received the attached follow-up email to invite me to a webinar, the creative linking back to the exhibition and signposting a discount offer unique to attendees of the show. I signed up for the webinar, and had another demo today. For me, the picture is complete and I now have all the information I need and will be buying Sage Act! at some point soon. Get a life! Why are you reviewing a trade show?! All too often in my experience, exhibitions are criticised as a waste of money, time or both. From what I saw on the day, I’m sure for many exhibitors this was true. However, as Sage have shown, the key to successful exhibition marketing is to have a strategy for engaging with your customers and prospects Before, During and After the show, exhibition or event. Well done Sage, and thanks for supplying the photos of the exhibition stand and agreeing for their use in this post. What do you think? Are you in sales or marketing and have any trade show marketing tips to share? 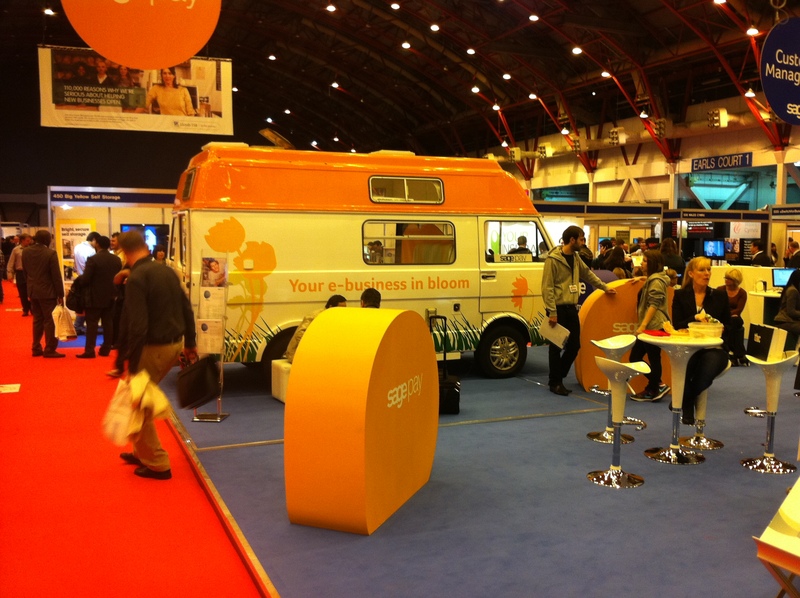 How does your business maximise the return on investment from trade shows? I’d love to hear your thoughts. This entry was posted in Case Studies, Demand generation, Marketing, Uncategorized and tagged 'B2B Marketing', 'social media', 'Steve Revill', business start up, case study, marketing, marketing case study, marketing consultant in st albans, Sage, Sage Act, Trade fair, trade show marketing tips on December 7, 2011 by Steve Revill. Loving the way some businesses are fully engaged with twitter in this way. Real service delivery. Thanks Mark, I completely agree. I wonder if everyone else will eventually ‘catch up’, and if will this erode the cut through that brands like Sage are able to achieve in this way?